Bump is my original felted design. It is a large and sturdy project bag, knitted entirely in stocking stitch. 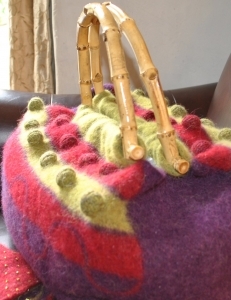 The embellishments are added by using colours in stripes and also some simple embroidery prior to felting, and by tying marbles into the fabric before you felt it. These are then removed by they leave perfect little ‘bumps’ of un-felted fabric. The bag is felted in the washing machine. The pattern includes a simple needle case design. I rate this this as easy and is suitable for knitters of all abilities.